Malaga Airport Transfers can transfer you to any beach on the Costa Del Sol. The minibuses are all equipped with trailers for any extras you may have at no extra charge. There are 320 days of sunshine on average on the southern coast but life guards only work for 90 days in the summer. Care has to be taken when swimming because the direction of the currents change all the time. Last year in Marbella 3 people drowned in one day. Spanish hotel owners have been pushing for life guards to be present for 7 months from April to October. The first signs of sun and the tourists are out in force, shirts off swimming trucks on. The sea will still be cold in April until early June but that won’t stop the sun worshippers, pilling on the sun block and braving the cold seas. You will walk along the promenade where you will see tourists nearly naked and Spanish people still wrapped in winter clothes. If you live on the Costa Del sol you will know it’s a standing joke, you can tell the tourists from the locals by their attire. You won’t catch the Spanish dipping so much as a toe in the water until the middle of July. Drowning in the world, accounts for the third highest cause of accidental death. The world figures for drowning are 450,000 every year. The highest amount of deaths in Europe occur in the under 18s. Its estimated over 6,000 will die whilst swimming annually. The biggest amount of casualties will be in the under 6s, over 4,000 lose their life’s suddenly every year. The yearly deaths from drowning in Spain are 700. With 9 months of unattended beaches without life guards it’s easy to see how the loss of life can occur. With over 75 million tourists visiting Spain on average every year it is vital important for life guards to be available from April to October. One of the most important measures used in Spain are the use of coloured flags flying to indicate how dangerous the sea can be. Green meaning it is good to swim, yellow telling you to take caution and red do not go in the water. These flags are an advisory measure and not compulsory. These flags are very helpful but are only flown when the lifeguards work. Even if we could get flags flying from April to October this would be a great result. All the above statistics come from the International Lifeguards Congress 2012. 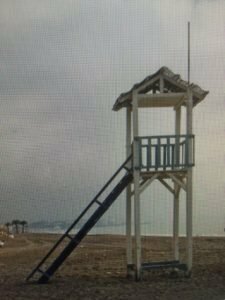 Below you can see a deserted lifeguard watch out tower and flag pole with no flag.